Azr Architects Sdn Bhd is located in Alor Setar, Kedah. Any enquiry related to architectual design, you can contact them at 6047303479. 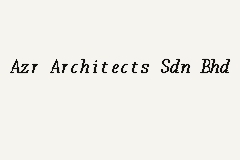 AZR Architects Sdn. Bhd. is committed to providing a competent level of architectural consultancy with a view of fulfilling the requirement of the client and the user. Professionalism and integrity are always paramount in all our dealings. Having been in practice since 1989 we have the knowledge and experience to handle a broad range of project including hospitals, naval bases, army camps, prison facilities, libraries, university buildings, schools housing, hotels and others. we firmly believe in the need to continually enhance our professional skills to better serve our clients. We pursue an innovative yet practical approach to design, placing great importance on issues of sustainability and the environment. AZR ARCHITECTS sdn bhd is a famous reputable architect firm of Malaysia. Contact them anytime for your project.